Description of "A HINDU'S FIGHT FOR MOTHER COW "
SANJEEV NEWAR is a prolific writer, speaker, and entrepreneur. He is a data scientist by profession. His thorough analytical skills are evident in his writings as well as products. His risk management products have been named in top 20 of the world for 2014 and 2015. He is the only Indian to have ever made to this list. He has been behind several inclusive and encompassing innovations. He is a mentor to several eminent young scientists of the country. Sanjeev Newar is an alumnus of IIT Guwahati and IIM Calcutta. 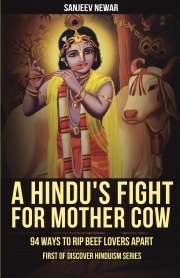 Reviews of "A HINDU'S FIGHT FOR MOTHER COW "